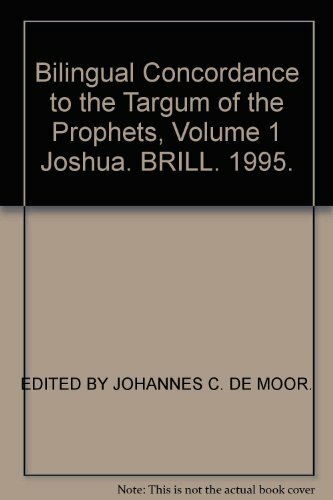 The bilingual (Aramaic-Hebrew) concordance to the Targum of the Prophets is the product of an international project based in the Theological University of the Reformed Churches in the Netherlands, Kampen (ThUK) and supported by the Netherlands Organization for Scientific Research (NWO). With this publication a major research tool becomes available to those engaged in research in Biblical and Jewish studies. The concordance makes a wealth of largely unknown material accessible to researchers. The discovery of the presumed-lost Song of the Lamb, referred to in Rev. 15:3, by members of the editorial team vividly illustrates the importance of such a concordance to both Judaic and New Testament studies. The concordance will also be an indispensable tool for the textual criticism and the history of interpretation of the Hebrew Bible. To facilitate consultation on the basis of the Hebrew, every concordance per book contains a Hebrew-Aramaic index. The final volume will contain a cumulative Hebrew-Aramaic index. Johannes C. de Moor, Ph.D. (1971), Free University, Amsterdam, is Professor of Semitic Languages and Israelite Antiquities at Kampen, The Netherlands. He has published on a wide variety of subjects including Ugaritic philology, Canaanite and Israelite religion, Hebrew poetry and the Targums. He is editor of several international series.